Since debuting his explosively funny, cutting edge multi-media show “A Journey Through Pop Culture” as the opener for Liza Minelli in October 2011, the master impressionist has been incorporating that poignant seminal moment of his life into a whirlwind tour impersonating your favorite celebrities from TV, film and music. 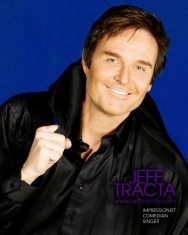 On April 24, Tracta brings his 100+ hilarious spot on impressions – from Bruno Mars, Usher, Ray Romano, Adam Sandler and the entire cast of “Family Guy” to Black Eyed Peas, Eminem, Lady Gaga, Billy Joel and Elton John – back to the room where it all began, the LVH Theatre at the Las Vegas Hotel and Casino. He is sharing the one night only musical and comedy extravaganza with five piece country a capella powerhouse Home Free (www.homefreevocalband.com), winners of Season 4 of NBC‘s “The Sing-Off” who just released their major label debut Crazy Life. Tickets are on sale now and priced between $49-100 plus tax and service charge (http://www.thelvh.com/calendar/298-jeff-tracta-home-free–together-1-night-only). Premium seats ($100 tickets) include a VIP meet and greet with a CD giveaway. Tracta last headlined a showroom in Vegas in May 2012, when he performed at The Pearl Concert Theatre at the Palms Casino Resort. Tracta has since performed hundreds of corporate gigs for thousands across the U.S., including such prominent destinations as Mandalay Bay, Red Rock and other five star resorts worldwide. “A Journey Through Pop Culture” is co-created and produced by John McEntee,President and Founder of TEI Entertainment, who is one of the nation’s leading talent buyers and producers; McEntee negotiated and secured a 5-year contract (with options) for America’s Got Talent winner, musical ventriloquist Terry Fator, to perform at the Mirage. Another reason performing in Las Vegas is special to Tracta is that it’s the city where he first performed his impressions onstage and received the initial encouragement that led him to create shows around it. The first of these was “Agency,” an autobiographical one man show he performed at L.A.’s Coast Playhouse, which was produced by Charles Randolph Wright, who more recently directed“Motown: The Musical”on Broadway. Tracta’s galaxy of impressions and the many famous people he morphs himself into onstage is reflective of his expansive resume, which reads as if it details the career of a multitude of performers. As a recording artist, he made three albums which achieved triple platinum sales status worldwide and led to performances in Holland, Switzerland, Italy, India, Finland, Germany, Belgium, South Africa. . . over 30 countries total. For the latest news and more information on Jeff Tracta, please visit http://www.jefftracta.com, Facebook, Twitter and Vimeo.